The sural cutaneous nerve consists of the fusion of the medial sural cutaneous nerve (MSCN) which is a terminal branch of the tibial nerve and the lateral sural cutaneous nerve (LSCN) which is one of the terminal branches of the common fibular nerve. 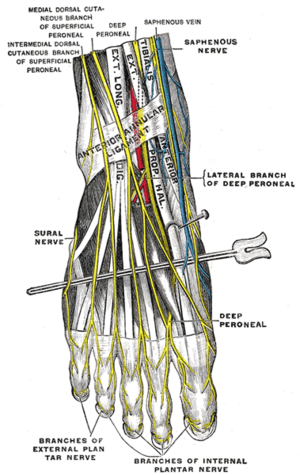 These two branches, MSCN and LSCN, are connected by the sural communicating branch and form the sural nerve. How the two branches fuse, the contribution of the fibular and tibial branch, the location of the connection, and differences between the two lower extremities contribute to variability of this nerve. From the mid calf down to the ankle the nerve courses subcutaneously along a line drawn from the mid-posterior popliteal fossa to just posterior to the lateral malleolus and thence under the malleolus and forward along the lateral aspect of the foot. It supplies sensation to the skin of the lateral foot and lateral lower ankle. The sural nerve is purely sensory and it supplies sensation to the lower lateral leg, lateral heel, ankle and dorsal lateral foot. Damage to the sural nerve due to injury can occur as a result of trauma, fractured calcaneus, damage from surgery in the region. This injury may not cause significant deficit or disability due to overlap of other nerves. As the sural nerve is purely sensory function dysfunction results in only a relatively trivial deficit. For this reason, it is often used for nerve biopsy, as well as the donor nerve for nerve grafts. However, there is also evidence of a higher complication rate than peronial nerve biopsy leading to post-operative pain, dysaesthesia and parasthesia during follow ups. The pathway of the nerve includes a non-extensible anatomic fibrous arcade, beyond which it runs superficially in the distal third of the leg. This arch is wide, thick, and unyielding and may fit tightly around the nerve, causing chronic, frictional irritation. Symptoms most commonly associated with irritation of the sural nerve include chronic (because the diagnosis is usually missed for a long time) pain in the posterior aspect of the leg, usually exacerbated with physical exertion. Radiating pain/tingling into the foot may occur distally, which may or may not be accompanied by referred pain proximally in the calf. In the case of neural irritation at the location of the fibrous arcade clinical examination may reveals tenderness with palpation posterior and lateral to the myotendonous junction of the Achilles (at the location of the fibrous arcade). Monofilament testing has also shown good reliability. As with any nerve irritation syndrome manual soft tissue techniques can be used to decrease frictional irritation in the area. ↑ Drake, Richard, et al. Gray's Anatomy for Students. 3rd Edition. Philadelphia: Churchill Livingstone/Elsevier. 2015. ↑ Brandsma JW. Wagenaar I. Post E. Nicholls PG. Reliability of Clinical Nerve Function Assessment in Peripheral Neuropathies. Leprosy Review. 2014; 85: 29-35.